Two undergraduates involved in START ? the National Consortium for the Study of Terrorism and Responses to Terrorism ? recently teamed up with two students from CIDCM ? the Center for International Development and Conflict Management to represent the University of Maryland in the Central Intelligence Agency (CIA) Recruitment Center's largest analytic simulation competition to date. The University of Maryland team Courtney Davis, Ben Goldstein, Josh Lacey and Colleen Warner competed among about 50 students from 12 colleges in the region. Teams were charged with playing the roles of intelligence analysts who were tasked to assess information and collaborate with other teams to answer key intelligence questions stemming from a hypothetical regional crisis situation. "It was our job to sort through the intelligence presented and create a policy memo and briefing for the United States," said Warner, a senior majoring in government and politics and minoring in terrorism studies. "Under a tight time constraint and as raw intel continued to come in, we discussed the event's repercussions and what the United States's best choice of action would be." Students were tasked with figuring out what information and sources were trustworthy and which should be discarded. "In our final memo brief, we attempted to piece together the information we had received to deliver an accurate, concise picture of the situation for U.S. policymakers," said Goldstein, a senior majoring in marketing and minoring in terrorism studies. All part of the College of Behavioral and Social Sciences, Goldstein and Warner teamed up for the competition with Lacey and David, both seniors majoring in government and politics and working with CIDCM. A rare opportunity Though the team from Washington College took top prize, Goldstein said every student who participated won something very important from their participation: the opportunity to meet and interact with CIA agents. "As someone who's thinking of going the intelligence analyst route, it's an amazing opportunity to get a feel for how the intelligence community works," Goldstein said. 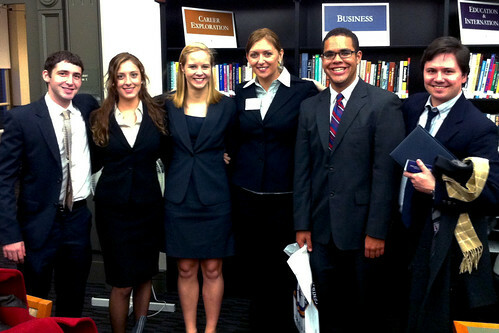 "It is also a great opportunity to network with CIA analysts. The fact that the identities of most CIA intelligence analysts are kept secret makes the chance to network with them all the more rare." The students and their faculty advisers met a group of about 25 CIA mentors and role players from the agency's analytical arm, the Directorate of Intelligence (DI). The DI team, in total, represented more than 200 years of CIA experience. "Especially with positions in the CIA, it's often difficult to try and discuss the nature of the work with an analyst, so participating in a simulation is a great way to get a feel for the work," Warner said. "So much of the CIA and its work seem like such a mystery, so an opportunity like this is great to get an idea of what the work could be like." START and CIDCM preparation The students on the University of Maryland team said their previous work and preparatory sessions through START and CIDCM gave them a strong foundation as they went through the simulation. The students said their faculty mentors played a crucial role in preparing them for the event. Daniella Fridl, CIDCM assistant director and researcher, and Devin Ellis, CIDCM simulation developer and faculty research assistant, provided background knowledge, suggested readings and prepared them for potential pitfalls. Their work at START also helped prepare Goldstein and Warner in the START class "Practice in Terrorism Studies," Goldstein and Warner are learning how to formulate concise policy memos. "The START program has also opened my eyes to the intelligence/security community as a whole," Goldstein said. "I've found that the people here have a wealth of experience in the national security community and they are willing to help students looking to break into the field." Warner agreed, explaining how START has helped her pursue her interest in terrorism studies, which was sparked by a trip to Northern Ireland in 2003. "I've focused extensively on that conflict and will be heading back to Ireland and Northern Ireland as a teaching assistant in January with the UMD winter study abroad program," Warner said. "My START experience has opened the door to many new opportunities and led me to look into the counterterrorism field, the federal government and the intelligence community."